Premo! Sculpey is firmer than Sculpey III, and extremely durable when baked! 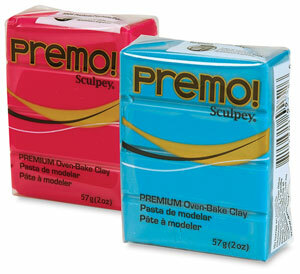 From the makers of other Sculpey clays, it's a premium line of polymer clay. Designed especially to satisfy the needs of the artist, Premo! comes in a palette of vibrant colors modeled after those of oil paints. Beautiful used as is, they can also be mixed with other polymer clays, powders, or pigments for custom effects. Perfect for everything from sculpture, bead making, unique wearable art, and molds, to rubber stamping and home décor, Premo! is ready-to-use straight from the package. Smooth and pliable, it's easy to knead, yet stays firm enough for detailed work without crumbling. Oven baking hardens your creations, yet they remain flexible and durable, harder to break than those made with other clays. Classics Set of 12 — This set contains 12, 1 oz blocks, including one each of Purple, Cobalt Blue Hue, Green, Zinc Yellow Hue, Black, Silver, Rhino Gray, White, Burnt Umber, Cadmium Red Hue, Orange, and Gold. Sampler Set of 24 — This set is a great way to experiment with the most popular Primo! Sculpey colors. It contains 24, 1 oz blocks of clay, including one each of Antique Gold, Black, Bright Green Pearl, Bronze, Burnt Umber, Cadmium Yellow, Copper, Ecru, Gold, Gray Granite, Magenta Pearl, Orange, Peacock Pearl, Pearl, Pomegranate, Purple, Purple Pearl, Spanish Olive, Sunshine, Silver, Translucent, Turquoise, Wasabi, and White.